Once they developed a taste for grass, the ancestors of today's elephants swiftly broadened their leaf-only diet and placed their progeny on a new evolutionary track, a study said Wednesday. Early tuskers were moving into open grassland millions of years before their teeth were adapted to grazing, according to a paper in the journal Nature. The research, based on analysis of the fossil remains of east African proboscideans—the order containing mammals with tusks and trunks like elephants and mammoths—claims to show that animal behavioural "choice" can shape the way a species evolves. It had been known that grass "grazers" evolved from leaf "browsers"—but not whether this happened before or after they acquired their new teeth. In the case of proboscideans, the study showed their diet evolving about eight million years ago as a changing climate turned the African continent into a more arid place with grassland progressively replacing woodland. While they still had access to leaves, which their teeth were adapted to chew, these early elephants rapidly started to add substantial amounts of grass to their diet. The molars of leaf "browsers" are flatter than the higher, much more ridged and wear-resistant teeth that today's elephants use to grind grass, which is tougher than foliage, and the soil that sticks to it. The change in proboscidean teeth only started about three million years after the dietary shift, according to the study by palaeontologist Adrian Lister of London's Natural History Museum. "This long delay between the behaviour change and the evolutionary response suggests that behaviour led the way," he said in a statement. "The theory that animal behaviour may play an important role in the origin of new adaptations has been discussed for over 100 years, but it has been very difficult to find concrete examples". 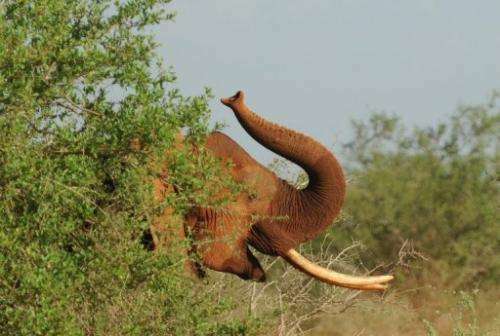 Elephants today eat grasses and herbs, leaves, tree bark, fruit and vegetables.